Sun-dried tomatoes lend their unique flavor to this delicious pasta and chicken recipe that makes a terrific light summertime meal. Heat olive oil and butter in large skillet over medium heat. Add mushrooms, sautÃ© for 5 minutes. Add shallots and sautÃ© another 3 minutes. Add chicken, tomatoes and milk. Cook for 5 minutes, stirring occasionally. 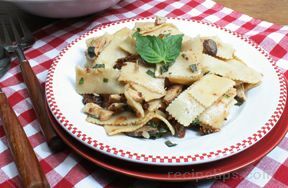 In large serving bowl, toss pasta, sauce, cheese, basil and salt. Serve immediately with extra cheese for garnish.